Every time we cook our food for our daily meals, we keep on throwing out heaps of vegetable scraps and we end up with full trash bins. But did you know that we can regrow vegetables, fruits and herbs? Imagine how much we can add to our savings from re-growing them, and we can also reduce our carbon footprint(s). It’s about time to serve the planet! After all, it has been tirelessly serving us with its fruit-bearing trees and flavorsome herbs. Carrot – this kid-friendly vegetable is one of the favourite veggies of kids and grown-ups too. Its bright orange color makes it fantastic for fresh salads. 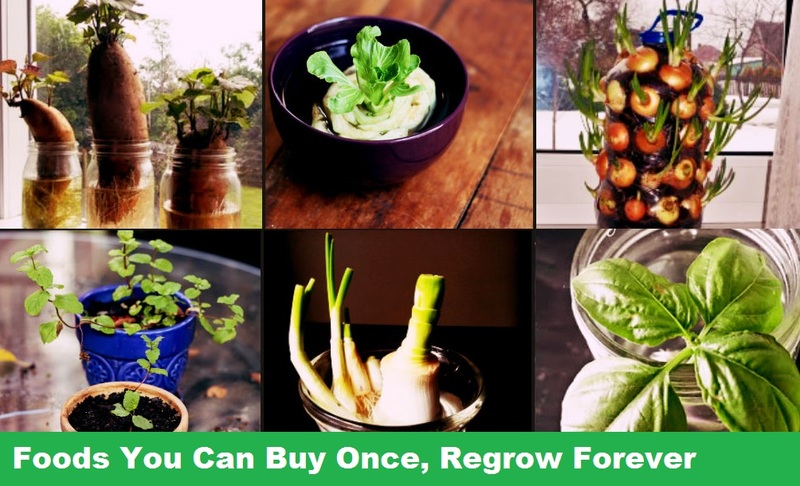 You can easily re-grow them by cutting the top and soaking it into water. Wait for some weeks and you’ll enjoy your nutrient-packed carrots. Celery – it is a flavorsome spice for soups and broths! Re-grow it on its base. Soak it in water as you do with your carrots. Just make sure that the stalk is firm enough as this will serve as its foundation. You have to use clean water for this to avoid germs and bacteria otherwise your celery will rot and it will really smell awful. Bok Choy – it’s fantastic as a main veggie for potages and sauteed recipes. Just like celery, you can re-growing it from its base. The same procedure like how you re-grow celery. Soak it in clean water and slowly it will grow. You can transfer it in a small pot when it has grown of at least seven inches. If vegetables can be re-grown easily, fruits are also simple and easy! Avocado – this nutrient packed fruit is common to many areas in the world because it is easy to re-grow it. Dry the avocado seed. Insert at least three toothpicks into the seed. Soak it in water and store it in warm dark place. After a week, you can plant the seed when it has sprouted. Tomatoes – this super delicious juicy fruit is very common in various food blends all over the world. It can be sauteed with cabbages and it can also be added with fresh vegetable salads like lettuce. To re-grow it, dry the seeds under the sun. At the end of the day, spread them on your backyard. In just a few weeks, you will see how it gradually grow into a tomato shrub. Pepper- hot and spicy peppers don’t need much care and attention as pests don’t feast on them because of their hot flavor. This makes it easy to have them in your yard. Simply dry the seeds under the sun. Plant the seeds in your yard with at least ten inches gap so as not to overcrowd your garden. You’ll be amazed how it will bring you lots of hot and spicy peppers without much effort on your part. It’s very easy right? Simply use the methods above and enjoy your home-grown vegetables and fruits. Save money from buying pricey foodstuff in local supermarkets by cultivating them in your own garden.